Texas is experiencing its worst season of wildfires in a decade, forcing police chief Josie Gray to evacuate the citizens of Artemis and the surrounding ranchlands. Not everyone makes it out alive, however. In the fire's wake, Josie discovers the body of someone who didn't leave in time, inside the partly burned home of a local country music singer. A syringe found near the body offers an answer for why the deceased missed the evacuation. The question remains, though, why the unlucky soul was in the house in the first place. As Josie investigates, digging further into the country music scene and its hard-living characters, she begins to wonder whether or not something more sinister took place. 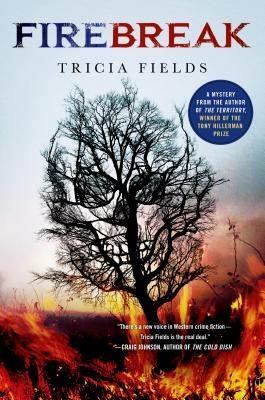 Firebreak continues Tricia Fields's award-winning Josie Gray mystery series, which has drawn acclaim for its detailed portrayal of this remote corner of America and the tough, resilient people who call it home. TRICIA FIELDS lives in a log cabin on a small farm with her husband and two daughters. She was born in Hawaii but has spent most of her life in small-town Indiana, where her husband is a state trooper. She won the Tony Hillerman Prize for her first mystery, The Territory, which was also named a Sun-Sentinel Best Mystery Debut of the Year, and was followed by Scratchgravel Road and Wrecked.